Activities section of Dewees Island Blog app. editors note: I don’t know anything about golf, but I get asked about it a lot. This guest post is written by dear friend and dunes colleague Jennifer O’Brien, who has worked in the local golf industry for years. Leave comments below: Which one of these is your favorite? Where do you play most often? Is Dewees Island Golf Accessible? ABSOLUTELY! Dewees Island is regionally located within thirty-six minutes of ten renowned golf clubs, two of which are two of the oldest in South Carolina. Did you know Charleston is credited with bringing golf to America? Shipping records show that clubs and balls were brought to Charleston as early as the 1640s, and the Country Club of Charleston can trace its origin back to 1786. As a novice or scratch player, Dewees Island affords you a quiet, serene beach setting not available on most islands outside of Charleston. Leaving from the Dewees Island parking lot, let’s explore the best courses for you. Wild Dunes resort is the closest golf to Dewees. You can see the 17th and 18th holes from the South side of Dewees; they are just across the inlet. Wild Dunes has two courses for you to enjoy. The Harbour Course is only a six minute drive from the Ferry parking lot. Designed by Tom Fazio, the Harbor Golf Course is known for its challenging design and beautiful views, and most of all, water. 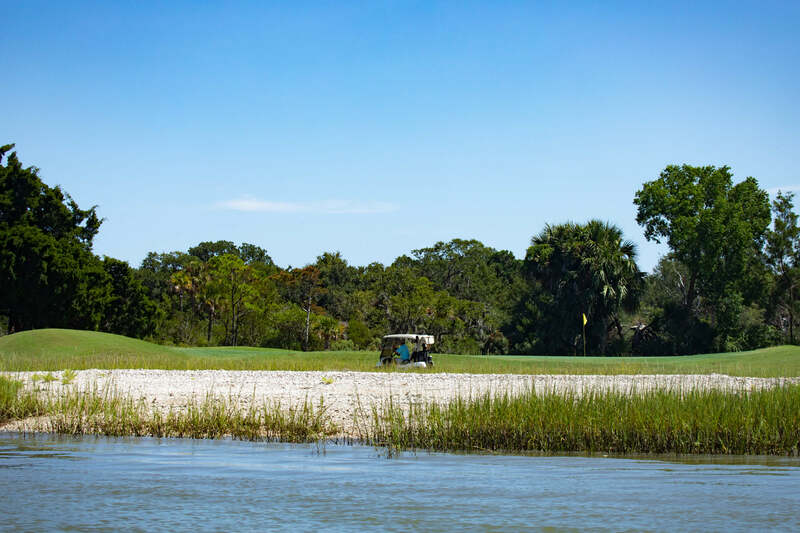 From lagoons and salt marshes to the Intracoastal Waterway, this varied golf course will test all aspects of your game. The Links Golf Course was Tom Fazio’s first. Today, it’s newly renovated and still among his favorites – and he’s not the only one. From the rustling palms lining lush, rolling fairways to a finishing hole overlooking the glistening Atlantic Ocean, the Links Course is South Carolina golf at its finest. Snee Farm is located fifteen minutes from the Ferry and just off the Isle of Palms connector. The Club is home to a George Cobb designed, championship golf course. The 6,834 yard, 18 hole, par 72 course boasts picturesque marsh views and offers an experience that is enjoyable yet challenging. The course is home to the famous amateur tournament, the Rice Planters. Many notable names have won and competed in this event held each June, including Davis Love III, Stewart Cink, and Mark O’Meara. Only 15 years young, the Daniel Island Club is one of the new kids on the block for golf in the area. As one of the top private golf clubs in Charleston, the Daniel Island Club features the country’s only private pairing of golf courses designed by Tom Fazio and Rees Jones playing out of the same clubhouse. 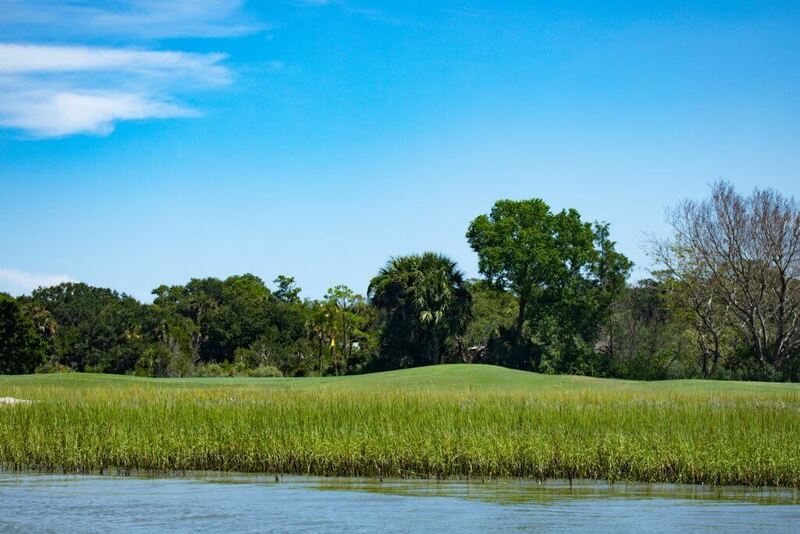 Both nationally ranked courses are perfectly integrated into the breathtaking Lowcountry landscape. The Beresford Creek Course is the Tom Fazio-design. At 7293 yards from the championship tees, the par 72 course traverses pristine marsh, creeks and waterways, providing incredible views. In traditional Fazio style, holes have been shaped and contoured to create challenge and drama for players at every level. Ralston Creek, Daniel Island’s second 18-hole masterpiece, is a par 72 course playing 7,446 yards from the championship tees. Opened in 2006, the course was named among the nation’s top new private courses by Golfweek and Golf Digest magazines. Once home to a stop by the Web.com tour, you may catch a glimpse of one of Charleston’s local celebrities, a few NASCAR racers and Hollywood stars who play here. Charleston’s oldest club is locally referred to as The Country Club. Its present location was built on the McLeod Plantation and designed by renowned architect Seth Raynor. The number 11 hole is a replica of the 15th hole at North Berwick in Scotland and is so treacherous that Sam Snead carded a 13 and Ben Hogan, when asked how he liked the hole, replied that it should be dynamited. The Country Club has been home to several famous golfers. Beth Daniel, who grew up in Charleston. She won the US Women’s Amateur in 1975 and again in 1977. Her professional career includes 41 wins, one major, and she is an inductee into the World Golf Hall of Fame. Henry Picard, a golf professional at The Country Club from 1925 – 1934, is also an inductee of the World Golf Hall of Fame. Henry won the Masters in 1938 and the PGA Championship in 1939. Most recently, the club hosted the 2013 USGA Women’s Amateur Championship, and will host the 2019 US Women’s Open Championship May 27th – June 2nd. Yeamans is the second oldest Charleston course, opening in 1926. Similar to The Country Club of Charleston, the course was also designed by Seth Raynor. Built as a winter retreat for wealthy families from the north such as the Rockefellers and Ford’s, the current design was restored in 2015 to Raynor’s original layout. In the 1980’s the original Raynor blueprints where found by the Superintendent in the clubhouse attic. Once you drive through the gate it’s as if you’re transported back in time. It’s like playing in a Raynor museum with all his characteristics at work here. Bulls Bay is a unique club, unlike any others in South Carolina. Designed by Mike Strantz, this once flat stretch of Lowcountry coastline has been transformed into a landscape reminiscent of the great links courses of Scotland and Ireland. Roughly two million cubic yards of earth were moved to reshape the site. At Bulls Bay, Strantz created 75-foot elevation changes and 360-degree views unlike any in the Lowcountry. Unofficially, the club house sits on the highest point of land in the lowcountry. The course boasts firm, sandy turf and ever-present wind off the ocean. It is a true links golf experience reserved exclusively for its members and their guests. A new program was introduced in 2016, like none other in the Charleston area! Dual and Triple Club Membership options are available with Dunes West Golf, Rivertowne and Snee Farm Country Clubs. You can enjoy all three courses and the amenities each has to offer through one membership. Rivertowne is also affiliated with the ClubCorp network which gives you access to over 200 private clubs and special offerings at more than 700 hotels, resorts, restaurants and entertainment venues worldwide. 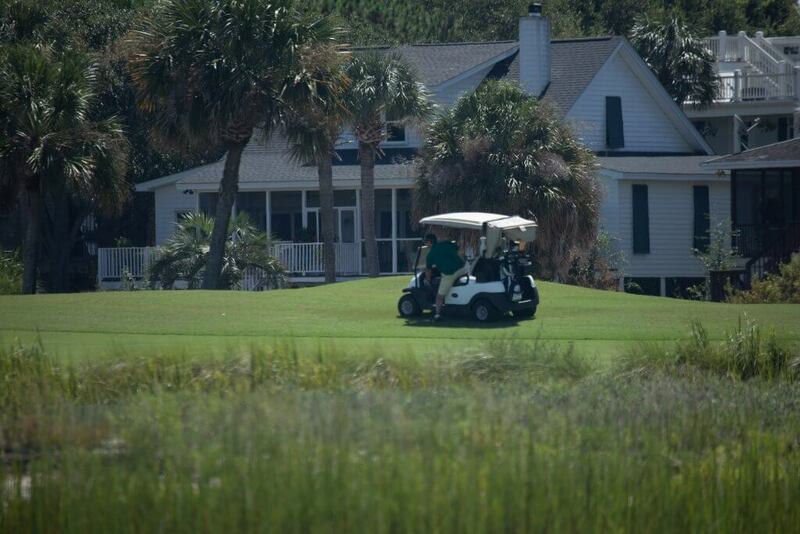 Living on Dewees Island, you have an abundance of opportunities to play several of the top courses in Charleston. A benefit to lowcountry living is that the courses do not close in the winter. You’ll be able to enjoy golf year-round. The alligators, water hazards and bunkers are ever-present on the course, but so is a cool breeze, plush fairways, and fast greens. Dewees Island is the perfect launching pad for this lifestyle. You’ll enjoy the quiet serenity of a lesser inhabited island, no crowds and the ease and relaxation of lowcountry living. Jump on the ferry to the mainland for some easy swings and the enjoyment brought on by a great round on a great course. Don’t forget to comment in below and let us know which of these courses is the best! Jennifer O’Brien is a Dunes Agent who helps with Judy’s buyers and sellers on Dewees, and takes care of her own clients on IOP and surrounding areas. If you’re looking for something on Dewees, you can reach her through Dewees Real Estate. If you’re looking for something off Dewees, you can find her here. Tell her we sent you.